For an ecommerce business, marketing can easily be one of your most time-consuming tasks, but it is by far one of the most essential for your success. 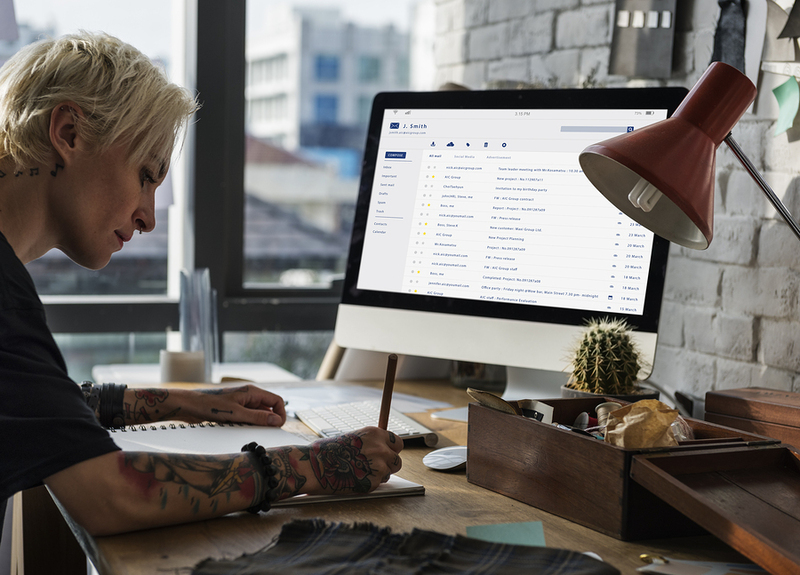 Paid-advertising campaigns, social media management, and content marketing strategies may dominate your strategy, but what about email marketing? Is it still relevant? Email marketing is still one of the most effective methods for engaging customers and driving leads and sales. It’s predicted that there will be about 2.9 billion email users by 2019 and if your ecommerce business isn’t using it, you’re probably missing out on some crucial sales. If you haven’t fully built out your email marketing plan, here are six automated email ideas you can start using today. Welcome emails are one the most important emails that you should be sending out. In fact, nearly all customers (74.4 percent of them) expect to get a welcome email if they buy from you online for the first time or sign up for your mailing list. They’re actually much more likely to make a purchase from your welcome email than from any of the email newsletters or promotions that you send later. Of course, it’s far too time-consuming to send out welcome emails individually. Save time by setting up automated welcome responses using tools like MailChimp or Constant Contact. Welcome emails aren’t sales emails; they’re simply introducing the customer to your brand and thanking them for choosing you. It’s a good idea to give subscribers a hint about how often they’ll get emails from you. And with a light touch, you might introduce some of the features or products on your website. If you’re feeling super generous, you could even offer a little discount. This is a great way to generate sales and build your mailing lists. Additionally, sources suggest that customers that read at least one welcome message from a business are 40 percent more likely to read future emails from the company over the next 180 days. If you still need more proof, Easy-SMTP discovered that welcome emails generate an incredible 320 percent more revenue than all other kinds of promotional marketing email, and have a better open rate than newsletters by 50 to 86 percent. It just goes to show how important creating and sending welcome emails is, and how beneficial they can be for your business. Plus, if you put the work into crafting a strong welcome message and then set it up to send automatically, you’ll save time and energy in the long run. It’s low hanging fruit. One of the best ways to sell your products is by showing your new customers all the positive reviews from your old customers. But first, you have to spend the time to collect these reviews in the first place. The best and most effective way to secure these emails is to set up automated email triggers when customer makes a purchase. Depending on your product or service, wait a few days or even a few weeks to ask for feedback. Don’t wait so long that your customers forget you. These automated messages should ask customers to review your product or service. They can be simple, like asking customers to respond to your email, or you can use a survey tool like SurveyMonkey or even GoogleForms, so that all your responses can be collected into a spreadsheet automatically. The point is to avoid handling each individual review email if you can. But, you should always read your customer reviews. If your customers take the time to give you feedback, read it and thank them for it. Even negative feedback is valuable. You probably won’t publish the negative ones on your website, but it can give you a good sense of what’s not working for your customers so you can improve your product or service. Automatic review requests mean loads of positive content for you to use! Be sure to make sure these emails are perfect by editing them and even asking other people to read them over once to make sure you didn’t miss any errors. It’s worth noting that over 24 percent of customers will continue to return to a vendor for over years if they have a positive experience. If nearly a quarter of your customers continue to buy from you for the next two years, this will do wonders for your rates of success and the lifetime value of each customer. To put things in perspective, 55 percent of customers who are willing to make a purchase with a company have backed out or changed their minds when they read negative reviews. On the other hand, 86 percent of customers say they are willing to pay an extra 25 percent just for better customer service. The figures don’t lie, and providing the best level of customer service you can take the success of your business to unprecedented heights if you’re willing to take the feedback onboard. The majority of the customers that most ecommerce stores are reaching through email are relatively disengaged, meaning that they made a one-time purchase and never returned. Using automation solutions, such as Litmus, you can set and create emails to reconnect with these customers, asking them if there’s anything you can do to help, suggesting products they may be interested in, or maybe even sending a “miss you” coupon code for their next purchase. One effective example of re-engaging inactive customers was a campaign that SideKick ran. The email that they sent to inactive customers actually states that they have been disengaged for so long that the company is going to remove them from their mailing list. 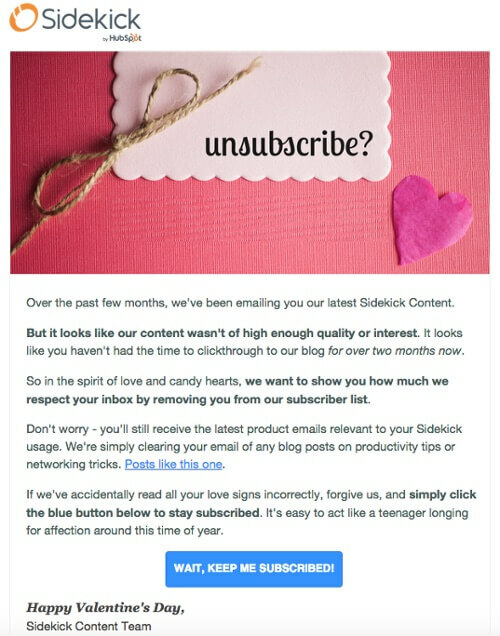 But SideKick makes a strong case for staying, with links to high-quality content and a clear call to action, asking recipient to stay subscribed to the mailing list. 4. Related products that you’re going to love! Sending your customers emails with products related to things that they were previously interested in (or have purchased) is more commonly known as upselling. This is a tested way to increase your overall sales and revenue, and to keep your customers coming back to your store. Maybe your customer has just purchased a music player, for example. Now, why not offer headphones, cases for their music player, or any other related accessories that they might be interested in. Try to get creative with your upselling email subject lines, so your customer is much more likely to open them. 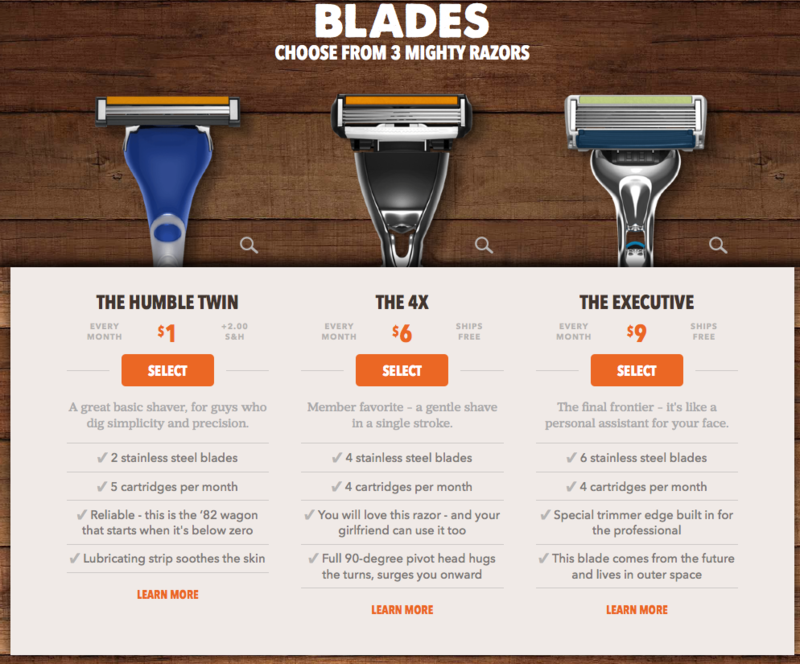 One of the best examples I’ve seen of upselling emails comes from the Dollar Shave Club. The email is professionally laid out, and it’s extremely easy to navigate and see everything clearly. Instead of directly selling related products, this company takes it one step further and compares and contrasts their own products, so the customer can pick the one that is best suited to them. Okay, so you don’t want to sound desperate, but one of the most common problems that ecommerce stores face is abandoned shopping carts. You were so close to making that sale, and then they decided to leave. Maybe it just wasn’t meant to be? Wrong! Using automated emailing marketing, you can set up triggers for days, or even weeks, that will send your customers a reminder that they have items pending in their baskets and carts, jogging their memory and making them want to make their purchase. The initial reason a cart is abandoned could be one in a million things, but a gentle nudge in the right direction could be all they need. As a rule of thumb, the emails you’re sending your customers shouldn’t be all sales all the time. They should really be a ratio of 80/20, just like all other marketing channels. This means 80 percent of your content should be educational or useful. Only the remaining 20 percent should be promotional. Let’s say your ecommerce store selling running shoes. You could provide your customers with information about running events in their area, or tips for increasing endurance—bonus points if you make parts of your message easily shareable on social media. If you’re running a blog as a source of useful and educational content, one way to automate is to pull your blog’s RSS feed into your emails so that you can automatically send your followers an email digest on a regular basis without as much hands-on work. As you build out your email marketing campaign, think of it as an opportunity to run tests to help you figure out what types of messages resonate most with your target market. But, don’t bombard your customers with too many emails. Just because you can automate email doesn’t mean that sending them three emails a day will be anything more than annoying.